Summer is in full swing and with it comes the dreadful heat. To stay cool during the hot summer, you can use a personal misting system. Personal misters allow you to keep the outside temperature down whether you are on the run or just lounging at home. There are several different kinds of personal mist systems you can use. From mist stands that connect to garden hoses to misting fans, you can find a portable mister that will work for you. If you are on the run a lot with work or personal errands, a misting bottle or fan mister is probably your best bet. You can get a hand-pumped mister or battery-operated personal mister depending on your needs. A mist bottle is a simple bottle with a specified water capacity that can be hand- or battery-operated. Simply fill it up, turn it on and stay cool. If it is hand-pumped, you will have to pump up the water pressure before it will work. If your personal misting system is operated with batteries, make sure you get the correct size and check them often so they do not corrode and ruin your portable mister. You can also you a fan mister or a personal mist system that has a fan attached. Many of these portable mist systems keep you extra cool because they have the added bonus of a fan. Whether you choose one that requires batteries or one that just needs to be hand-pumped, you cannot go wrong with a misting fan. Another type of portable misting system is a flexible mist stand. Also known as cobra misting stands, these personal misters require a water source for operation. 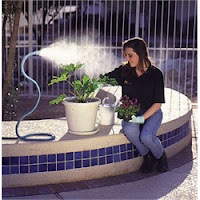 Mist stands easily attach to a standard water garden hose for operation. One of the best things about flexible mist cooling stands is that they can stand on their own, wrap around a tree, umbrella or chair arm and provide instant cooling for any amount of time you need. As long as your garden hose is running, you will have outdoor cooling relief from the hot summer sun. Cobra misters are great for when you are attending family reunions, neighborhood get-togethers or just working out in the yard or sunbathing. They are easy to use and wonderful for keeping oustide temperatures down. You can enjoy more time outside and on the go with a personal mist system. Summer does not have to be dominated by the horrific heat if you have a portable mister.